Posted on April 30, 2018 at 5:20 am. We begin today with WOLF PACK PRIDE!! Thanks to all the students and staff who got into the spirit of Spirit Week and dressed in their best WMS gear today. You’re looking good, Williamsburg! 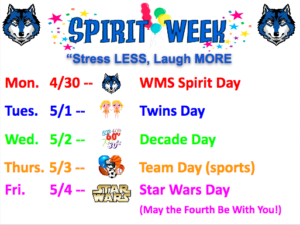 Now here’s the Spirit Week rundown for the rest of the week: Tuesday we’ll be seeing double on Twins Day; Wednesday will be a blast-from-the-past with Decade Day; Thursday is for all our sports fans with Favorite Team Day; and finally, in honor of May the Fourth — next Friday is STAR WARS DAY!! So get into the school spirit, wolves, and BE A PART OF THE PRIDE!! And now as part of Spirit Week, we’d like to welcome a pair of special guests to the WOLF-TV Studio. Say “hello” to Ms. Zeller and Ms. Flynn! FLYNN: Good morning, Wolves! I’m Ms. Flynn. ZELLER: And I’m Ms. Zeller, and we’re here representing the Student Services Staff. April is Stress Awareness Month, and May is Mental Health Awareness Month. So this week, we are combining the two for a special activity here at WMS. FLYNN: Starting today, we will be promoting a positive and healthy lifestyle with the “Stress Less, Laugh More” campaign. ZELLER: This time of year can be difficult for everyone. With SOLs, final exams, and the impending “end of the year” looming before us, it’s natural for emotions to run high — and for anxiety to loom large. FLYNN: But there are many strategies that YOU can use to help reduce your own stress. We’ll be sharing some of these techniques with you every morning this week, in a new initiative that we call: The Mindful Moment. ZELLER: Mindfulness means being aware of yourself, of your feelings and emotions — and accepting them. FLYNN: Throughout the Stress Less, Laugh More campaign, we encourage EVERYONE in our community to ACCEPT the way you feel, to look within yourself for STRENGTH…. ZELLER: And above all, remember that it’s all going to be okay. As stressful as it may seem now, I promise that one day soon you’ll be able to look back and LAUGH. ZELLER: Have a stress free week, Williamsburg!! Thanks for that Mindful Moment, Ms. Zeller and Ms. Flynn. I feel less stress already! And now, back to the news. I don’t want to alarm anyone, but there have been some “stranger things” going on in the woods around Williamsburg lately. Let’s take a look! Well, that was different. Tune back-in tomorrow as we delve deeper into this doorway mystery. The WMS Kindness Club will be meeting on TUESDAY during ASP 1 in room 134. There a ton of fun activities lined up for rest of the year — so you won’t want to miss it! And new member are always welcome. See Mr. Johnson, Ms. Schaefer or Ms. Zeller with any questions. And now for an important announcement for all TAB Book Club members. If you’d like to participate in next week’s Skype with award winning author Stuart Gibbs, then your permission slips MUST be turned in by this THURSDAY — AT THE LATEST. Again, without a signed permission slip, you will NOT be included in the Skype with Stuart Gibss. See Ms. Lord with any questions.